Late last year I travelled by boat from Esperance in Western Australia out to Middle Island in the Recherche Archipelago to see its famous (if little visited) pink Lake Hillier. 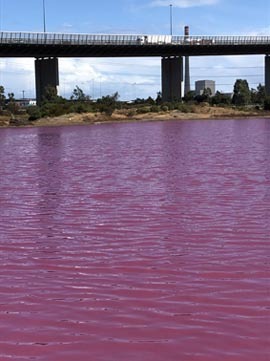 Why did I bother, right now I can drive to Melbourne’s equally pink lake in 15 minutes or so? ◄ Westgate Park nestle under the Westgate Bridge on the east side of the mouth of the Yarra River. The park features a little cluster of lakes, one of them salt water and that one is currently bright pink. It’s a late summer combination of high temperatures, lots of sunlight and low rainfall, combined with algae which produces the pink colour with beta carotene. Quite natural and very spectacular, but it won’t last long.